I’ve not been following this project for that long, but since I started suffering with PPD and anxiety I have been trying to find different places with support groups etc. and one of the things I came across was The Keep Smiling Project on Leonie’s blog, Miss Leonie Wilson. I got in contact via Twitter and I am so excited to announce that I am now officially part of their team! I feel very strongly about mental health, how other people perceive mental health issues and supporting those who are suffering. Please go and take a look at their Twitter, give them a follow and join in with the weekly chats on a Sunday afternoon at 6pm (BST). 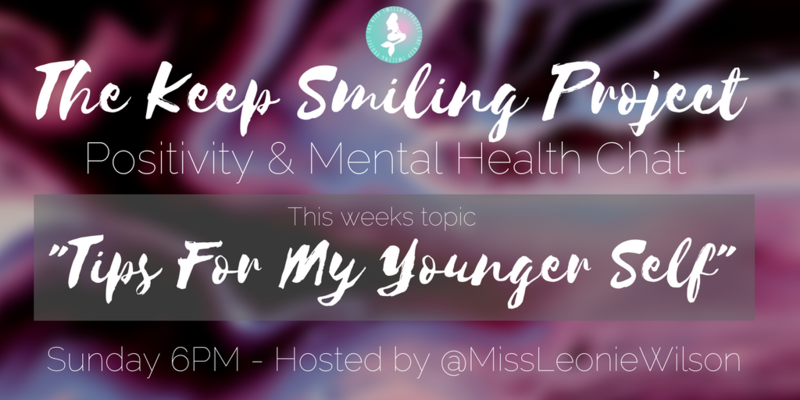 This weeks chat is hosted by Leonie (@missleoniew) and the topic is ‘Tips for my younger self’.